Banks produce revenue a variety of ways, from familiar fees on checking and savings accounts to sophisticated trading of stocks. A traditional model of bank revenue for decades has been the ability to charge customers higher rates than what the cost of funds are. The challenge recently has been the ultra-low interest rate environment that has limited banks’ ability to charge more on loans. 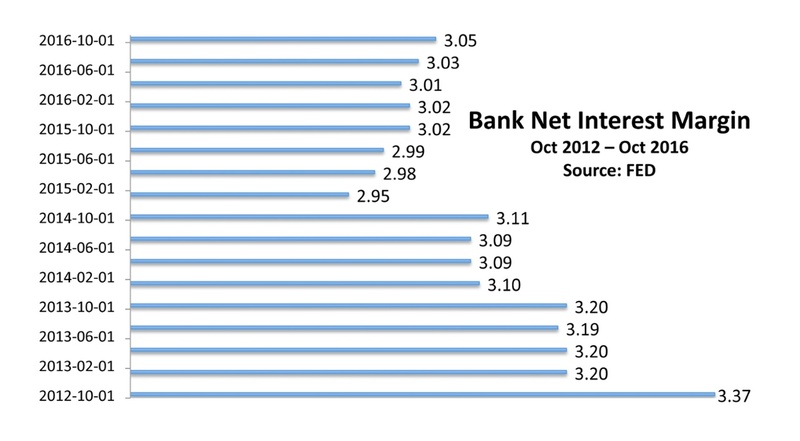 Data released this past quarter by the St. Louis Federal Reserve reveals that the “net interest margin” for banks has started to slightly increase. Economists and analysts view this as a positive sign whereas banks tend to lend more as rates increase while allowing them to earn more as well. Regulations enacted in 2009 following the financial crisis limited the ability of U.S. banks to profit from trading in bonds, which shifted their focus to profiting from stock trades instead. The problem for banks over the past few years has been that the brokerage industry has become extremely automated, thus driving down margins on equity trading for all major banks and brokerage firms. The onslaught of ETFs and trading algorithms has reduced the demand for individual stock trades that have generated most of the fees. With the Fed on track to raise short-term rates at least two more instances this year, banks are on track to benefit from a rising rate environment.